I hadn't originally planned on doing a post when I originally wore this outfit two weeks ago out to dinner with some friends but when I posted a shot of the clutch and booties on Instagram and Biana posted that I had better do an outfit post I figured why not? I really do love this tank top and the booties... well they've been my favorite booties for awhile now so it makes sense to do a post on it! For some reason whenever I go out I always turn to black as my outfit go to, probably because I love to wear a fun bold lip or shoes and I feel like black is always my safest bet! For this look I went pretty basic. I wore minimal jewelry so I didn't take away from the intricate design of the neckline which is by far my favorite part of the shirt! Not to mention how soft and comfy it is. Since we weren't doing anything super fancy I paired the top with jeans (my comfy ones since this was the night we went to an all you can eat place!) and of course these fun studded Vince Camuto booties I got for a steal! Of course I went with the bold red lips because red lips make any outfit look better! those shoes are just to die for!! i also love the location of your shoot. I SO love that clutch! Nothing basic about this look! The booties are stunning with the rocker details! That outfit is perfection!!! Loving that top and those booties! Super chic! All-black is a go-to for me, too. You look gorg! so glad you blogged this!! Oh my gosh, your booties!! So freaking cute! I really need to get into H&M soon! Black is always my best bet, too! It's just so effortless. Love those booties! Those shoes are FAHIEEEEEEEEEEEERCE lady!!! You are rocking that look, for sure. 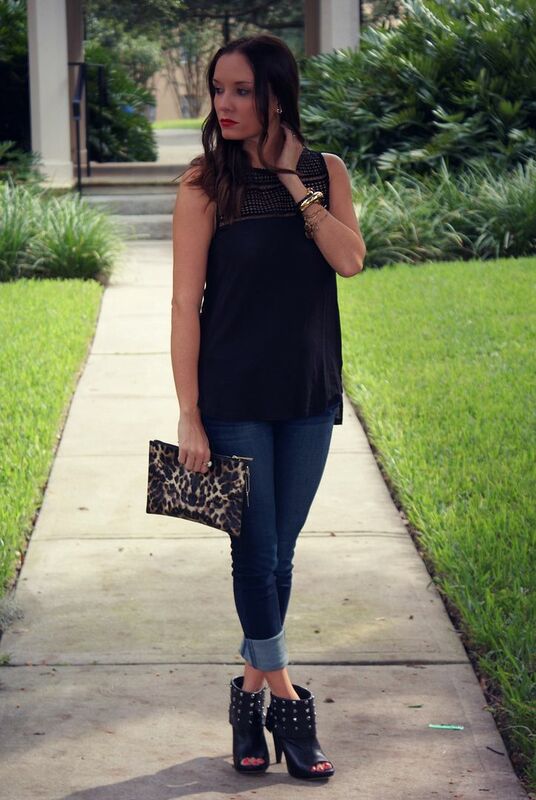 Those booties are so cute-- this is the perfect casual, but dressed up look! You look amazing! Love the design at the top of your tank, and those booties! I'm happy Biana talked you into sharing the details! Love everything about this outfit! That top looks so fun and I'm loving that clutch too. Perfectly dressy casual. Such a great look on you! I always go for black, too when we go out because it hides any over-eating I may do. Ha! Those booties also are fab. Love the fun detailing on this tank! And those booties are amazing! Those jeans are so perfect on you! And I LOVE that clutch!! Yes for this fab look! 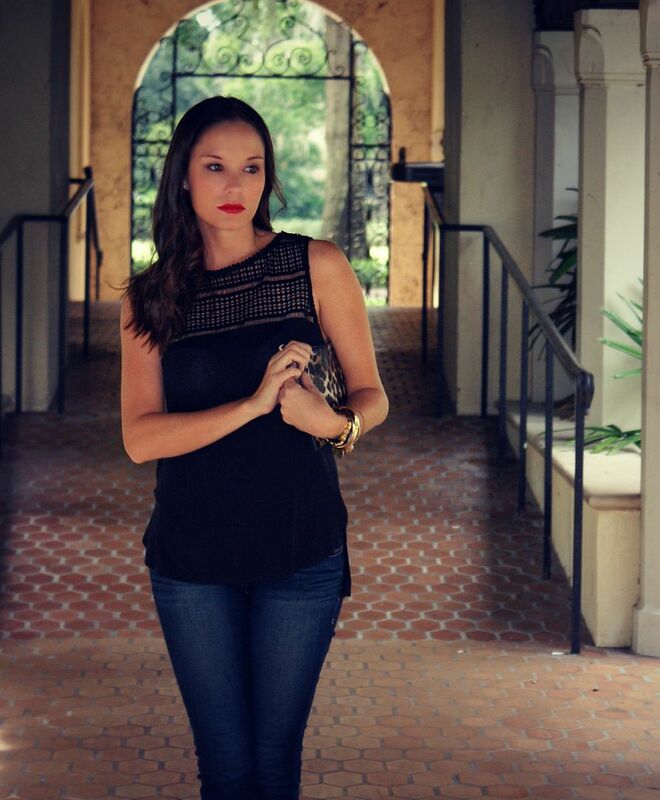 In love with that top -- and that bold lip is perfection! Those booties are amazing - and I dont even usually like booties! Super cute! I've been wanting to bust out my booties too! um those booties are gorgeous!! I love this whole look, simple, but incredibly chic! I love all black too although I never wear it. I was so shocked to hear that Anna Wintour said the one thing you'll never see in Vogue is black on black. But it's so classic and chic! Those booties are SO fun! And a red lip definitely makes everything pop! This outfit is so cute, I'm glad you decided to post it! Love that top. The crochet detail is beautiful! Absolutely love that tank and the booties of course! You look amazing! Also love the hot red lip! Really pops! This is such a great "out" look year-round. Hot booties! this outfit is so freaking fabulous. its perfect for going out without being over the top. those shoes though, holy amazing! Love that top and the leopard touch gives it that added touch of fierce! Black is my go to colour as well when I go out, love that top!! That shirt is so gorgeous! I love tops with interesting necklines. Those suede turquoise pumps are kinda my fun go to....throw on with every outfit and it just pulls it together pair of shoes as well. Thank goodness for the slightly cooler temps right? i love how you've embraced fall where you are and made it happen in hotter climates. love this look! Those boots! TO DIE FOR! Love everything about this, especially the clutch and top! You're so stunning! Love how the black top and boots have such intricate, interesting details! I really enjoy your blog so far and would love to follow each other--please join my GFC and I'll follow you right back! I am glad you made this look a post and shared as this look is great! Simple and so stylish. Cute top! Those shoes are HOT! Love how such a simple style makes such a bold statement! You look beautiful in these pictures friend! Those booties would never leave my feet! Perfect addition to this outfit and I love that lip color! Gorgeous!